Innovation’s 2nd Annual Teaching Fair!! 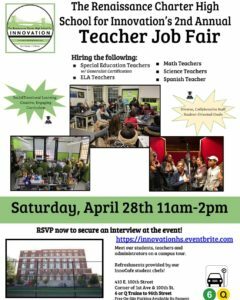 The Renaissance Charter High School for Innovation’s 2nd Annual Teaching Fair will be on Saturday, April 28th from 11 am to 2 pm. Check out our Work at Innovation Page to learn about the available staffing positions.